Thomas Bayrle, Wire Madonna, 2016 at ICA Miami. Photo: Fredrik Nilsen Studio. 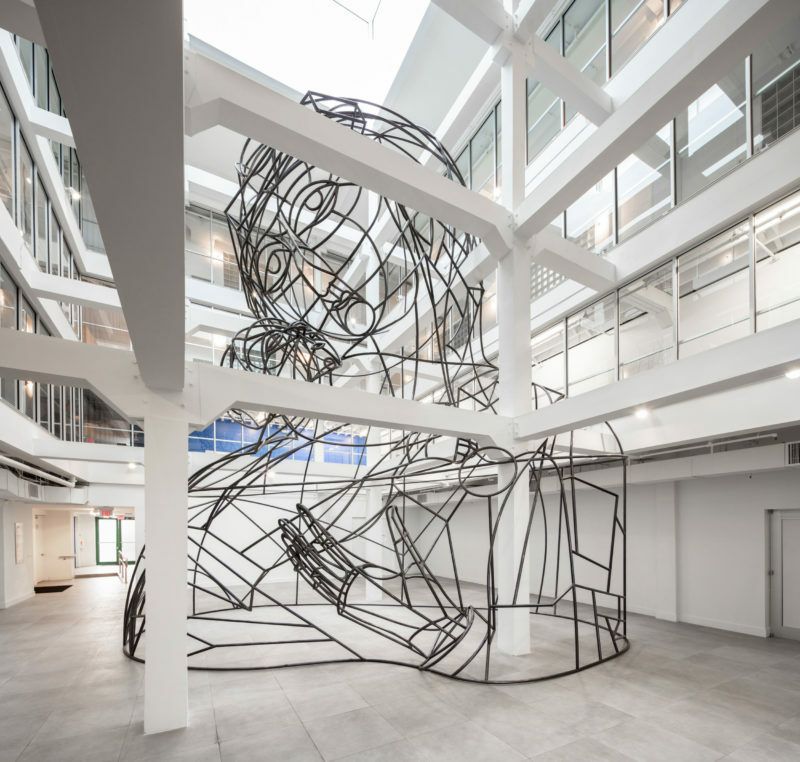 Wire Madonna is a monumental site-specific installation by Thomas Bayrle commissioned as part of the renowned German Pop artist’s first American museum presentation in ICA Miami’s former Atrium Gallery. Bayrle’s exhibition was ICA Miami’s final presentation in the landmark Moore Building as it prepared for the opening of its new permanent home in the Miami Design District. Wire Madonna is Bayrle’s most significant monumental sculpture to date, and is a radical dramatization of cultural icons that the artist has explored since the early 1960s. 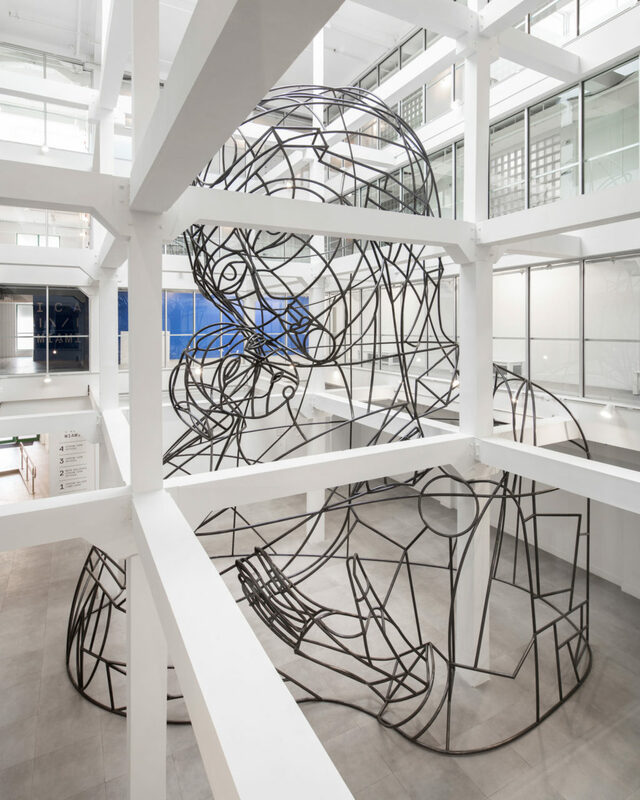 Engineered in steel tubing, the sculpture looms over the atrium’s gridded space. The theme of the Holy Family—foundational and ubiquitous in popular iconography, yet atypical in contemporary art—has occurred in Bayrle’s work in painting, screenprints, collage, and sculpture. For Bayrle, the pervasiveness and power of traditional icons persists today in new forms through popular images. Known for his prescient depictions of mega cities and bodies consumed by machines, Thomas Bayrle (b. 1937, Berlin) is a Frankfurt-based artist whose works spans mediums and movements including Pop, Op, and Conceptual art. His humorous and satirical multi-media works are characterized by “super-forms,” large images composed of repetitive smaller cell-like patterns. His work is influenced by his experience of growing up in post-Nazi Germany, where he trained and worked as an industrial weaver. Other major influences include the Frankfurt School of political and aesthetic theory and his collaborations on corporate identities with international corporations. This exhibition was organized by ICA Miami and curated by Alex Gartenfeld, Deputy Director and Chief Curator, and Stephanie Seidel, Associate Curator. Thomas Bayrle "One Day on Success Street" was funded through the Knight Contemporary Art Fund at The Miami Foundation. 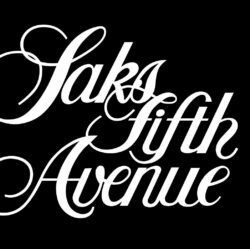 Major support is provided by Deutsche Bank; Saks Fifth Avenue; the Arlene H. & Laurans A. Mendelson Charitable Foundation; and the Ray Ellen and Allan Yarkin Fund for Exhibitions at ICA Miami. Additional support is provided by Gavin Brown’s enterprise, New York/Rome; Galerie Barbara Weiss, Berlin; and the Miami-Dade County Department of Cultural Affairs and the Cultural Affairs Council, the Miami-Dade County Mayor and Board of County Commissioners. Thomas Bayrle, Wire Madonna, 2016. Photo: Fredrik Nilsen Studio.